It is always a much better idea to buy your golf clubs as a set instead of one at a time as you get to save a lot of cash and get all the clubs you need in one package. For beginner and intermediate players, Precise M5 offers a great value as it is a relatively more affordable set. Also, it comes with all the basic clubs which are a 460cc titanium driver, hybrid, fairway wood, 5-PW irons, and a putter. It is always a much better idea to buy your golf clubs as a set instead of one at a time as you get to save a lot of cash and get all the clubs you need in one package. For beginner and intermediate players, Precise M5 offers a great value as it is a relatively more affordable set. Also, it comes with all the basic clubs which are a 460cc titanium driver, hybrid, fairway wood, 5-PW irons, and a putter. The clubs have oversized heads to make them more user-friendly, offset for getting the balls airborne easily, and they are made with both steel and graphite shafts. And you will also get a stand bag with the set and 3 headcovers for your large clubs. Oversize Heads: By giving these clubs an oversized head, the manufacturer makes them more user-friendly as they are hard to miss even for beginners and the larger head also creates a larger sweet spot. Offset: Getting the ball in the air is much easier with these clubs even for the beginner and intermediate players thanks to their offset design. Shaft: Precise Golf uses only the best shaft material on the clubs that make up this set to ensure top-notch performance. The shafts include true temper steel for the irons and 100% graphite for the woods. What You Get: Besides the set of high-quality clubs that you will get on your purchase, the manufacturer also provides some convenient extras. They include the dual-strap stand bag and the headcovers to protect the clubs when not in use. Golf bag stitching and straps are not the best quality. 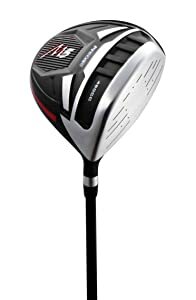 Whether you are a beginner or intermediate golfer looking for a set of golf clubs that will help you enjoy the game and also improve your skills, the Precise M5 is a great buy. For a set that comes with all the basic golf clubs, it is quite affordable and it is hard to think of another set that offers a better value. And this is more so given the quality of the clubs and the reputation of the brands. Convenience is also at the heart of these clubs as the manufacturer will supply them in a dual-strap bag for easy storage and carrying, and there are also headcovers for the large clubs. But, this is not entirely a complete set as there is no sand wedge and the quality of the bag is still quite wanting. However, the positive traits of the club set outweigh the negative ones, and so it is still worth buying.